So says Wisconsin poet Andrea Potos in “Every Body She Carries,” one of the eighty-eight poems in Diane Lockward’s uncanny anthology The Doll Collection. How do we become who we are, how are we drawn? For little girls, dolls have been an integral part of becoming. My grandmother used to call me her “Dresden doll,” after all, and sometimes I still am. 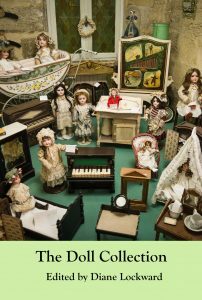 Much of this volume is devoted to antiques, collectibles, or memories of youth. Please don’t miss out on Frozen Charlotte! But there is no celebration here of the Sims, no Pokémon, no Bratz, no Ikuzis, nothing time has not softened. There are Barbies, Raggedy Anns, matryoshka dolls, Ginny dolls, and Chatty Cathies, whose Christian name (as we used to say) peaked in the U.S. at about 1950, a name almost never nowadays bestowed; there are the iconic American Girls. There is rare, surprisingly oblique engagement with the questions of female agency and the racialized stratification of identities, cerebral material that the sociological literature on dolls—and fashion modeling—is replete with. Do girls and women become who we are by filiation and descent alone or is there a force other than time, something innate and irrational, that shapes the chaos of who we are into the differentiated individuals we become? I believe that our desires are responsible for much of who we are: I believe love shapes us. And have we not all loved our dolls? The Doll Collection poets are heavy hitters. They are prize-winners of all kinds, including the Pushcart, the NEA and Pew fellowships. They are Poet Laureates. They have published in Poetry, The New Yorker, Prairie Schooner, Rattle, and Verse Daily. Most are in the U.S., but not all. They teach at universities nearby you and they edit journals you read. Editor Diane Lockward’s deft curating for her own imprint, Terrapin Books, leaves the reader with only one regret: she included none of her own poetry. Oh, vacant baby in mid-gesture. At the end of the poem, fecund, the snake ladies all choose a doll to nurse. This is the kind of poem that makes you turn off the room lights because the dark just feels right. From ordinary woman to goddess to doll—this book has it all. 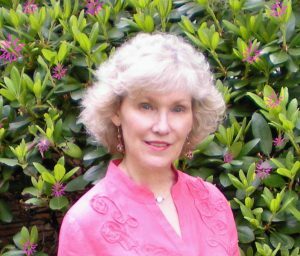 Judy Swann is a poet, essayist, editor, and bicycle commuter, whose work has been published in many venues both in print and online, including recently, Writing In A Woman’s Voice, Mom Egg Review, and The Way to My Heart: An Anthology of Food-Related Romance. She blogs at ebikeithaca.org. Her book, We Are All Well: The Letters of Nora Hall, has given her great joy. She is currently riffing on a cartoon superhero from the 1980s in a soon-to-published volume entitled Je Suis Stickman. She loves. She lives in Ithaca, NY.